Neonicotinoids are a relatively new chemical class of synthetic pesticides introduced in the 1990's and used in agriculture, public and domestic hygiene and also on animals. They can be considered as classic synthetic pesticides both by their mode of action and by their general features. They have a broad spectrum of insecticidal activity and are effective against a number of veterinary parasites such as fleas, flies and lice. But they have no acaricidal activity, i.e., they do not control ticks or mites. Most neonicotinoids are not systemic and have a tarsal and/or oral activity, i.e. they act by contact and/or after ingestion. Imidacloprid, the first neonicotinoid introduced in the market, and several other neonicotinoids have already lost patent protection and generics are available from numerous chemical companies (typically in China, India, Israel, Brazil, etc.). Neonicotinoids are related to nicotine and are agonists of the nicotinic acetylcholine receptors. The neonicotinoid takes the place of the normal neurotransmitter acetylcholine in the receptors, which cannot be deactivated by acetylcholinesterase and remains blocked irreversibly. This leads to an over stimulation of the nerve cells, to paralysis and to death of the affected insect. These nicotinic acetylcholine receptors are found in the central and peripheral nervous system of mammals, but only in the central nervous systems of insects. Neonicotinoids bind much more strongly to insect receptors than to mammal receptors, which makes them relatively safe for domestic animals and humans. Dinotefuran. Used in pets against fleas, and against houseflies and other nuisance flies in baits for livestock operations. Imidacloprid. Used in pets against fleas and lice, in sheep as a louisicide, and in baits against houseflies and other nuisance flies for livestock operations. Extensively used in agriculture and hygiene. Nitenpyram. Used exclusively in pets against fleas. Has a systemic mode of action. Thiamethoxam. Used in baits against houseflies and other nuisance flies for livestock operations, and also in agriculture. Imidacloprid is the most relevant neonicotinoid, used abundantly in spot-ons against fleas and certain lice species in dogs an cats. 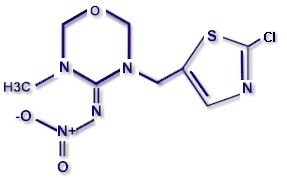 Since it has no tickicidal efficacy it is often combined with amitraz or synthetic pyrethroids (e.g. permethrin) to broaden the spectrum of activity. Its use on livestock is limited: there are baits for the control of nuisance flies in livestock operations, pour-ons to control sheep lice, and a few cattle pour-ons against horn flies and other fly species. Nitenpyram is used on pets as tablets for oral administration against fleas. They show a particularly fast killing effect: a few hours after administration >90% of the fleas are dead. However, it has no residual effect, i.e., protection against re-infestation ends around 24 hours after administration. It is also used in agriculture but not in hygiene. Thiamethoxam is not used on-animals but only in baits (scatter baits or paint-ons) against houseflies and other nuisance flies in stables, piggeries, poultry houses. etc. It is also used a lot in agriculture. Dinotefuran is used in spot-ons for dogs and cats against fleas, and also in baits against house flies. It is also used in agriculture and hygiene. For livestock and pets, as well as for operators and pet owners, the safety risks when using neonicotinoids are comparable to those of using products with other chemicals such as organophosphates, amidines, pyrethroids, etc. Correctly used they should be well tolerated by the treated animals and should not bear unreasonable risks for humans. However, care must be taken that children do not get in close contact with pets during the first days after treatment with such products containing neonicotinoids. It should be mentioned that imidacloprid is not yet allowed for use on cattle in many countries (e.g. USA, EU, Australia, etc. ), although a product efficient against resistant horn flies would be quite useful. There are no "official" reasons to this. BAYER has recently introduced a lousicide pour-on for sheep in Australia, but only for off-shears application. Imidacloprid has been involved in cases of mass mortality of bees. It has been reported that its correct use in agriculture does not actually kill the bees, but disturbs their orientation capacity, which perturbs food finding and returning to the mother colony. In the long term this weakens the colony that eventually dies. Recently (April 2013) the EU has prohibited for two years the use of several nicotinoids on various crops due to this suspected detrimental effects on bee colonies. This should have no influence on veterinary uses of neonicotinoids. Otherwise imidacloprid is toxic to fish and many birds as well as, and highly toxic to aquatic invertebrates. It is relatively stable in the environment (av. half-life in soil = 40 to 190 days). There are reports on housefly (Musca domestica) populations resistant to imidacloprid (resistance factor up to >500) and to thiamethoxam (resistance factor up to 76). So far there are no reports on flea resistance to imidacloprid or other neonicotinoids.